I confess that I often find Mexican food too dense for my garden-fresh sensibilities, so when I cook Mexican-inspired food at home, I lighten it up with lots of fresh vegetables, homemade salsa and herbs. We made these tostadas the other night and served the ingredients buffet-style, so everyone could pile on the garnishes to their taste. Fresh summer corn cut straight from the cob is sweet and crisp – no cooking required. When cutting the corn, lay the husked cob on a cutting board and carefully slice kernels off with a chef’s knife, rotating the cob. Sweep the kernels and milk into the bowl for the salsa. Serves 4 to 6. Whisk 1 tablespoon olive oil, lime juice, hot sauce, cumin, salt and pepper together in a medium bowl. Add shrimp and toss to coat. Set aside. Combine all of the salsa ingredients together in a bowl and mix well. Taste for seasoning. Heat 1 tablespoon olive oil in skillet over medium high heat (or prepare grill for direct cooking over medium heat). Remove shrimp from the marinade, shaking off any excess and transfer to skillet 0r grill. Cook shrimp until pink on both sides and just cooked through, turning once, 3 to 4 minutes. Transfer shrimp to a bowl. 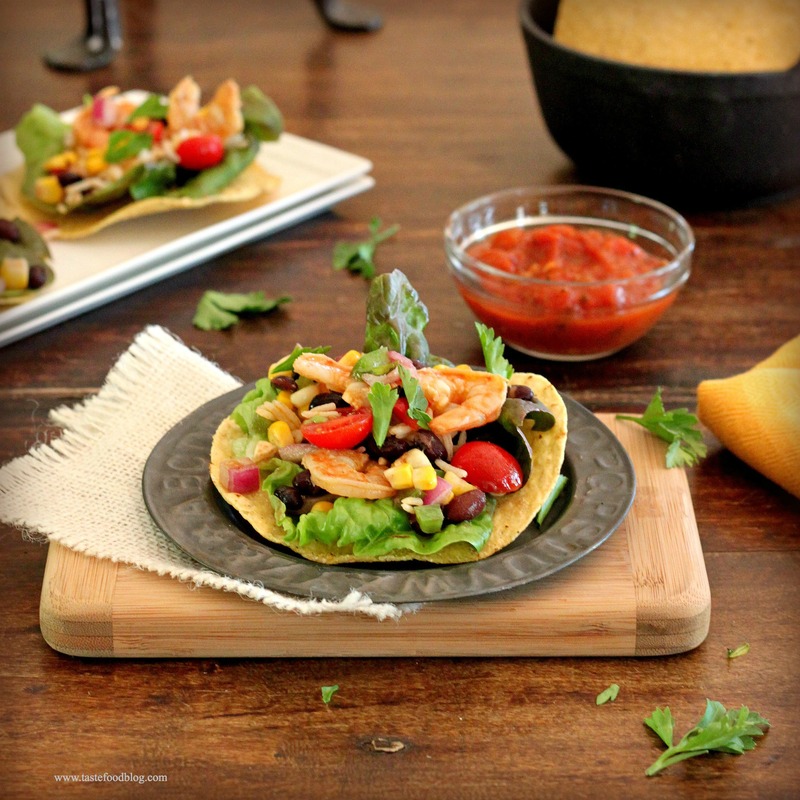 To assemble tostadas, lay a lettuce leaf over the corn shell. Spoon the black bean salsa over the lettuce. Top with 2 to 3 shrimp. Spoon tomato salsa over. Garnish with avocado slices and fresh cilantro. Squeeze a few drops of lime juice over each tostada. Serve immediately. I could load up on several scoops of the voluptuous summer salsa, but then I’d have to leave room for the tasty shrimp! A wonderful summer dinner, easy and bursting with seasonal flavor. Tasty and wonderfully summery! I love Mexican food. Looks great and seems pretty light for the summertime! The heaviness of Mexican food doesn’t bother me as much as some others, but it’s definitely a cuisine I wouldn’t mind lightening up every once and a while. Yummm! What a beautiful combination of foods. We love Mexican food and lightening it up isn’t hard at all. This looks great! As a wimpy vegetarian, I occasionally eat fish. So this looks perfect for an easy, casual dinner. Does this posting mean you’re back home, or is this the magic of scheduling posts?? Love build your own taco nights, will have to feature these the next time we swing one here.